A business phone system may seem complicated, but that's mostly because too many companies use "telco-speak," which is full of acronyms and confusing terms. It really doesn't have to be that way. Here's a plain English description of how it all works. Business phone systems include several basic components. 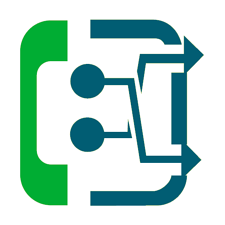 Softswitch: The softswitch is software that directs incoming calls to the right extension, automated attendant or voicemail box. It’s sort of the “brains” of the operation. Server: The softswitch resides on computer hardware called a server. Voice Service: Voice service is the method by which calls are delivered to the softswitch. Examples of voice service are VoIP, PRI lines (traditional telephone lines), SIP (Session Initiation Protocal) trunking and T1 data. Control Panel: The Control Panel is the interface that lets users administer and manage their phone system. It includes methods for things like moves, adds and changes, as well as reporting and information about system health. Network switch: A switch serves as a controller, enabling networked devices to talk to each other efficiently. Desk Phones: Of course, phone systems usually have phones. Value Added Services: These are all the whistles and bells, like our Heads Up Display, contact center features, voicemail transcription and paperless fax. 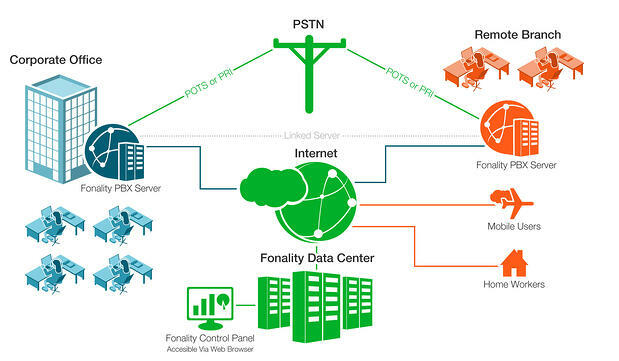 With the Fonality solution, the components can be arranged differently depending on how each client would like their solution deployed. Let's get into that. Out team of phone system experts is standing by to discuss your deployment options and help you decide what is best for your business. For customers who choose our cloud deployment, the softstitch, Control Panel and value added services reside on servers that are located in our data centers and managed by us. Most clients choose a multi-tenant deployment where multiple clients are securely supported by the same server, but others choose to have their soft switch on a dedicated server. Most clients who choose a cloud deployment also get internet-based voice services from Fonality. However, clients who prefer it, can bring their own voice and utilize traditional phone lines or even VoIP from another provider. The only equipment our cloud-based clients need onsite is the modem provided by the Internet Service Provider (ISP), a router, network switch(s) (if needed) and phones. The on-premises deployment is very similar to the cloud deployment except that the server on which the soft switch is loaded is located at the client’s location. As with the cloud deployment, clients can still select their choice of voice service, including VoIP from Fonality. The Control Panel and value added services are delivered over the Internet even if the switching functionality is on site. This means that even premise clients can still administer their system and enjoy features like Heads Up Display, from anywhere. If you’d like a detailed analysis of how Fonality could be deployed for your organization, please reach out to one of our experts today. Would you like more details about our deployment options? You’ll enjoy learning more about our Head’s Up Display. Are we in your budget? Schedule a call and let's talk.